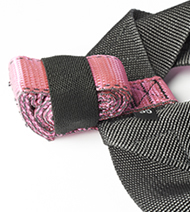 Available with Blue or Pink tether/leash that acts as a walking leash, and a sewn-in D-ring is also included for a regular leash. 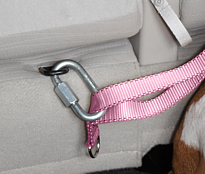 Help keep your pet safe, and also the other occupants of the vehicle! 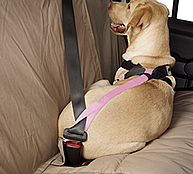 Seatbelt wearing humans are protected in most accidents, give your dog the same kind of protection! 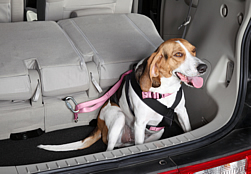 Dogs not secured by a harness can be ejected through the windshield, and even worse can crash into the head and neck of front seat passengers causing serious injury. 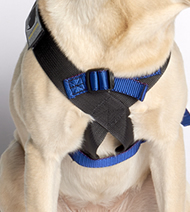 The Travel Safe Harness is so unique it's patented! 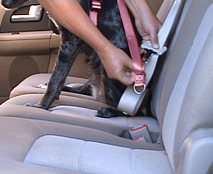 Statistics show pet travel has increased 300% since 2005 and 80% of pet owners travel with their pet. XSM 13" to 18" max 15"
SM1 19" to 23" max 19"
SM2 24" to 27" max 21"
MD1 28" to 30" 20" to 22"
MD2 22" to 24" max 15"
LG 33" to 41" 25" to 29"
XLG 33" to 49" 33" to 36"
* Pets should only be buckled up in the back seat just as you would a child. 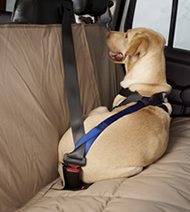 The airbag deploys with such force that it can injure or even kill a pet in the front seat. 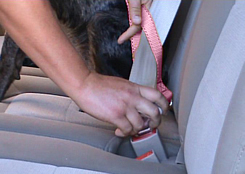 Easy to use, works with all automotive seat belts. 2 straps allow for adjusting the fit. 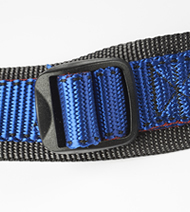 Adjustment straps secured using strong X-box stitching. 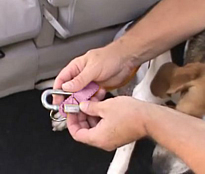 The tether/leash can be easily rolled and secured when not in use. Place harness over the head. Pull the dog's feet through the holes. Slip seat belt through loop on harness. Attach seat belt into receptacle. 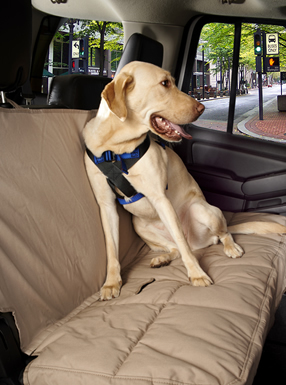 Your dog is ready to travel safely! Slip carabiner through loop on harness. Attach carabiner to vehicle mount.